Structure created to give children, adults and to the elderly, the disabled, the opportunity to spend days, weekends, weeks in contact with nature and to do recreational activities such as archery, judo, martial activities, mountain biking, laboratories, fun competitions, activities of environmental education for schools and youth groups, Green Week and Summer Centers and many other curiosities. Rooms available for parties, meetings and other ceremonies. Taste our genuine products, traditional and homemade. Direct sale of vegetables, fruits in season (corns, brown). Historic buildings structured to achieve barrier-free rooms with private bathrooms and studios. 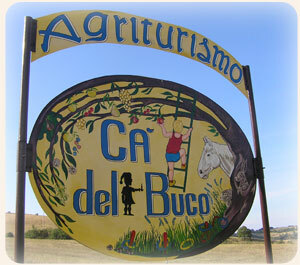 Ca del Buco is also a Bed & Breakfast with three "menu" for breakfast and is also a didactic farm for environmental education of children. Pets are welcome, fenced outdoor space is dedicated to housing horses. To ensure your visit is as comfortable as possible, we advise you to bring hiking shoes, long pants, hats and other clothing suitable for a stay in the mountains. It’s also of vital important to advise us, upon your arrival, if you suffer from any types of allergies or if you have any particular concerns. This information will allow us to assist you immediately in case of emergency.